Her honeymoon turned into a nightmare! A young wife (Beverly Garland, Swamp Women, It Conquered The World) is abandoned by her husband (Richard Crane, Mysterious Island, The Lone Ranger) on their wedding day. Distraught, she tracks him down to his ancestral home in the bayous of Louisiana, where, amid the swamps and the deadly undergrowth, she discovers a terrible secret. Her husband was saved from death by an experimental medical procedure involving serum derived from alligators ... and now he's developing horrifying side effects. 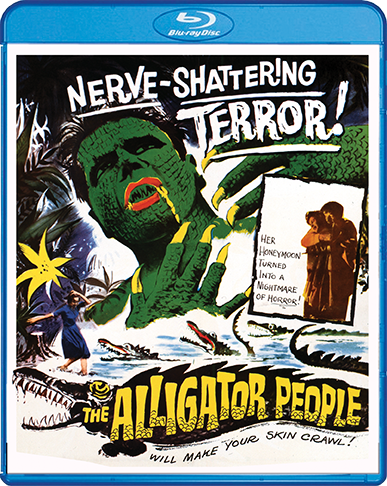 She'll face any danger to help him – including a brute with a hook for a hand (Lon Chaney Jr., The Wolf Man, Abbott And Costello Meet Frankenstein) – but soon discovers her love may not be enough.